Regen Power is Australia's leading renewable energy solution provider with Head Office in Perth and collaborative partners in China, India, South East Asia and the Middle East. We believe that it is important to monitor, manage and control your energy consumption as well as onsite power generation using solar photovoltaic and small scale wind generators. Regen Power has developed live remote monitoring systems suitable for different applications such as educational institutions, commercial and government buildings, remote mining camps and resorts , community power and mobile telecommunication tower power supply. 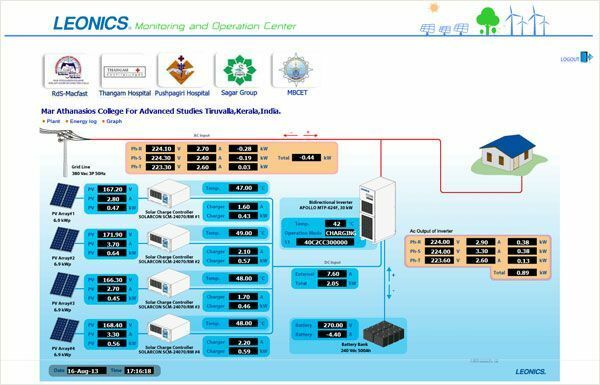 The system will enable the customer to efficiently monitor renewable energy installations remotely and cost effectively with live data. Regen Power can design and install any sized grid-connected solar photovoltaic panel system. 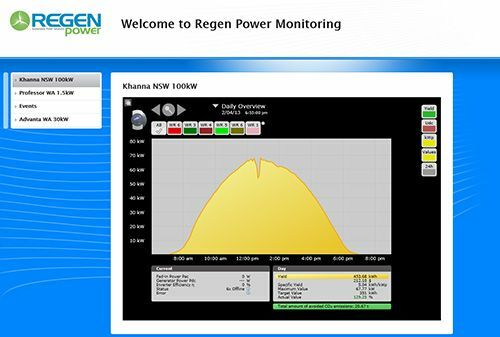 Please click here or on the image below to see examples of Regen-SolarLog Live Monitoring Systems installed and running at several commercial installations ( 10kW -100kW ). Regen Power in technical and financial collaboration with Radiant Solar Pvt Ltd – www.radiantsolar.us has provided design and engineering input to several installations in India . Most of these systems have battery back-up. Please click here to view some of our recent installations. Regen Power has developed a fully integrated hybrid system consisting diesel genset, battery storage, inverter, solar PV system and/or micro-wind turbines, and RegenSmart control & monitoring system to offer fully independent, clean and affordable power to your site.